Amid carnage on stock markets Monday, the most active gold futures contract on the Comex market touched a high of $1,345 an ounce, up 0.6% compared to Friday's settlement. Volumes were massive with nearly 30m ounces of April delivery gold traded by mid-afternoon as gold pared some of its earlier gains. Gold and the US dollar usually move in opposite directions but on Monday the metal attracted buying in spite of a jump in the value of the dollar against the currencies of the US's major trading partners. Fears about rising inflation after Friday's jobs report in the US are also benefitting the gold price, seen as a good storer of wealth. 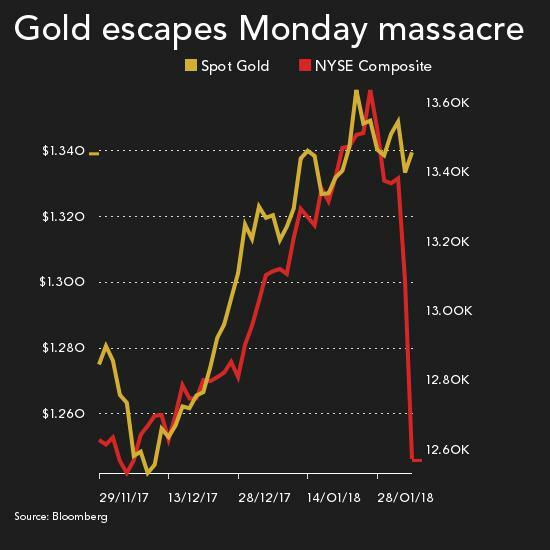 Gold has gained $90 an ounce since mid-December as large-scale speculators increase their exposure to gold on derivatives markets for the seventh week in a row. Hedge funds have more than doubled net long positions – bets that gold will be more expensive in future – to the equivalent of 21.4m ounces. Retail and institutional investment in gold-backed exchange traded funds (ETFs) also continues to grow. ETF vaults last week held some 2,255 tonnes or 72.5m troy ounces, levels last seen May 2013, as investors pile into the commodity seen as a safe haven amid turmoil on financial markets. US stock markets suffered their worst trading day in six-and-half years on Monday with the Dow Jones Industrial Index marking the worst points drop in its history. The blue-chip index ended down more than 1,100 points or 4.6% after falling by as much as 1,600 points in afternoon trade. The copper price also bucked the trend on Monday adding more than 2% to a high of $3.2575 per pound ($7,182 a tonne) in New York. Copper is up 24% in value over the past year and has added more than two-thirds since hitting multi-year lows at the start of 2016. Tight supply and prospects of a boom in demand has seen copper overtake gold as the first choice for private equity investors in the mining space for the first time.